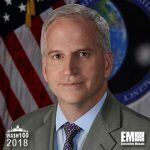 Executive Mosaic is glad to announce Robert Cardillo, director of the National Geospatial-Intelligence Agency, as an inductee into the 2018 edition of the Wash100 — Executive Mosaic’s annual selection of influential leaders in the government contracting arena — for his collaborative efforts in bringing the public and private sectors together. In September, NGA announced the completion of the sixth batch of 3D digital elevation models under the Arctic DEM Project in partnership with the National Science Foundation, Esri and the University of Minnesota. NGA also initiated talks with Congress to form a public-private partnership in an effort to facilitate the exchange of the agency’s data archives for industry algorithms, artificial intelligence and other computational methods. “The proposition is, we have labeled data sets that are decades old that we know have value for those that are pursuing artificial intelligence, computer vision, algorithmic development to automate some of the interpretation that was done strictly by humans in my era of being an analyst,” Cardillo said. At the GEOINT Symposium in June, he highlighted the need for public-private partnership and the challenge posed by extracting data and insights from full-motion video to NGA. NGA also established the Outpost Silicon Valley office in San Francisco, California, to attract and hire technology professionals under the agency’s Data-Enabled Workforce strategy. Cardillo became the sixth NGA director in 2014 after he served for four years as deputy director for intelligence integration at the Office of the Director of National Intelligence. Executive Mosaic congratulates Robert Cardillo and the NGA team for their selection to receive this award.